This past weekend INA-GRM held their INASOUND FESTIVAL where thousands of people came to watch amazing ‘Electro’ audio-visual concerts. 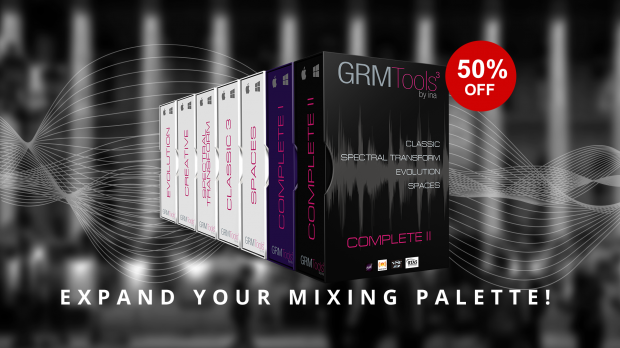 To celebrate this hugely successful event all GRM products are on Promo at 50% off. Get any GRM product here at 50% OFF ! 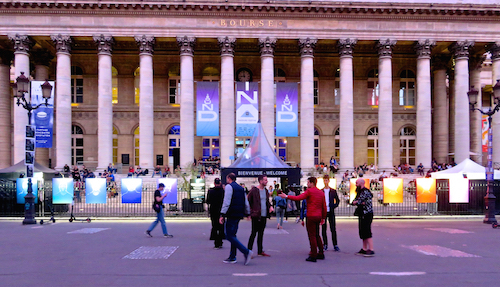 INASOUND FESTIVAL is a progressive electronic music and arts festival that takes place in the impressive Palais Brongniart, the old 19th century stock exchange in central Paris, France. GRM Tools were shown to the public on two different stands during their entire event. Organised by the National Audiovisual Institute, the festival is an important cultural event for the city, with a heady mix of electronic performances, visual stimuli, and ‘docu-concerts’. Engaging panels and masterclasses were held by artists such as Jean-Michel Jarre, Matt Black of ‘ColdCut’, JB Dunckel (AIR) and many others. 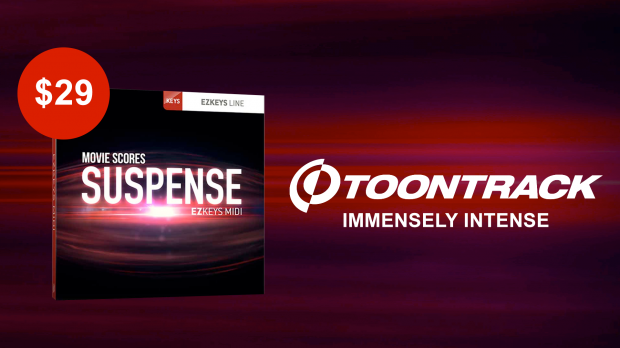 Toontrack release Movie Scores Suspense EZkeys MIDI, a fantastic collection, for your yet unwritten dramatic, intense and mysterious songs or scores! Get Movie Scores Suspense EZkeys MIDI Here ! There’s something about movies. Although we know how a plot will unfold, we’re still there – hooked and at the edge of our seats, waiting to be able to exhale that sigh of relief. Inevitably, music plays a pivotal role in this narrative. Arguably, there is nothing like it to emphasize a scene, an emotion or turn of events. Combined with pictures in motion, it’s almost impossible to not get submerged. That’s the combined power of two opposite forms of art working together in perfect symbiosis. This collection of EZkeys MIDI explores the many facets of the suspense genre. Expect an array of percussive, disharmonic and wildly expressive piano parts to help you convey anticipation, fear, relief and anything in between. Welcome to a musical palette that will not only set the mood for a broad range of musical scenes but also give you some out-of-the-box ideas for your next songs. MIA Laboratories develop the highest quality emulations of prestigious analog studio mixing effects that we have ever heard. They are available now for you to discover at great promo prices. 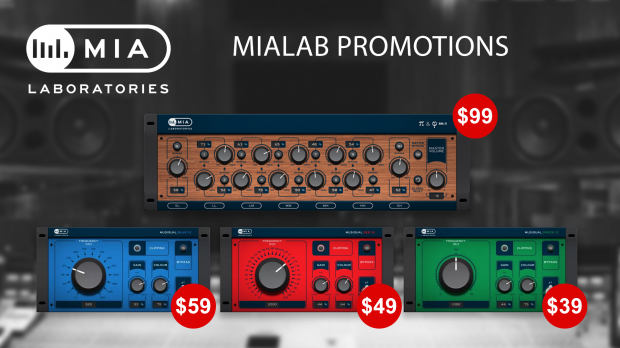 See all the MIA Laboratories’ Products Here and make big Savings! Pi and Phi is MIA Laboratories’ landmark product, designed and destined to impress. It enriches the mix and each of its separate contents with an overall acoustic effect that can only be described as super-enhanced vivacity and brio, with a warm yet powerful ‘sparkle’. The Musiqual Series EQ series gives the ultimate emulations of Class A, Tube and Transistor equalisers. They have a very different approach to the user interface that allows variations in tone from the very subtle to most intense you have ever experienced. The MIA Laboratories team is committed to exploring and stretching the capabilities of digital sound processing technology to its cutting edge. Following years of strenuous research, rigorous testing, acute listening, tweaking and then judging the results again and again, they have succeeded in what they set out to achieve. Fusing science, experience, knowledge and passion, MIA Laboratories can claim to be able to finally deliver all the most revered aspects of analogue sound, through digital processing. Their current products are the first of a series of next-level audio processing software tools they aim to create. Multiband dynamic processing can do things that would otherwise be impossible. MDynamicsMB from Melda is one of the best examples of this available. Now at 50% off the list price during “Dynamics Crunch Month”. 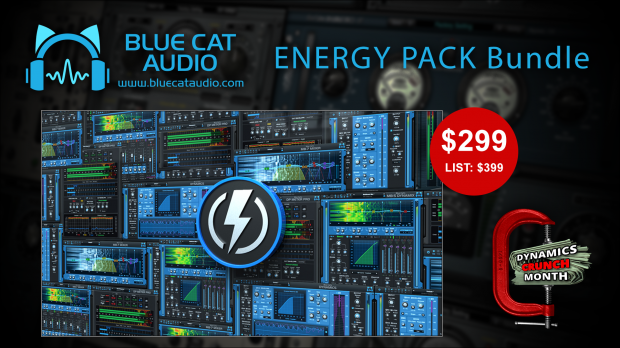 Want to bring energy and dynamics to your tracks? Looking for a complete wideband, multi-band and side chain dynamics processing solution? 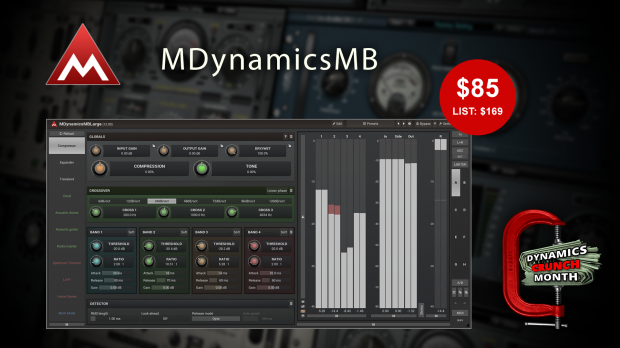 Now you can have get it for 35% off the list price during “Dynamics Crunch Month”. This bundle of plug-ins includes our best tools to manage the dynamics of your audio tracks: Blue Cat’s Peak Meter Pro monitors the levels and offers unique ducking capabilities thanks to its side chain features. Blue Cat’s Dynamics includes all you need for broadband dynamics processing, while Blue Cat’s MB-5 Dynamix takes care of multiband effects. Blue Cat’s MB-7 Mixer is the perfect companion for these dynamics processors: it will let you create powerful multiband side chain effects. Finally, Blue Cat’s Protector’s simple yet efficient limiting capabilities completes the bundle. The PSP Audioware FETpressor is Great for vocals, guitars, bass, drums, and whenever a classic 1970s-style FET compressor is needed. Now you can have get it for yourself at 50% off the list price during “Dynamics Crunch Month”. PSP FETpressor is a FET feedback type compressor plug-in. It’s designed to provide accurate, almost instant compression with lots of character. Great for vocals, guitars, bass, drums, and whenever a classic 1970s-style FET compressor is needed. 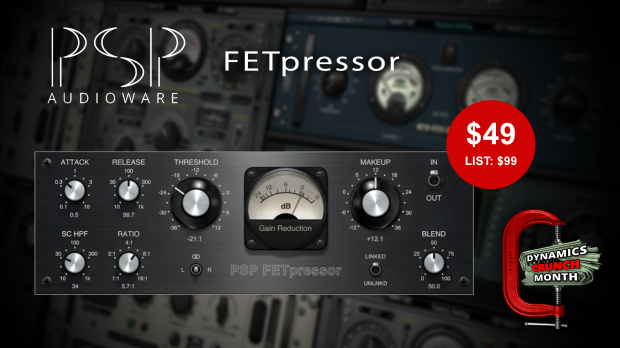 PSP FETpressor contains everything you’d expect from a FET compressor: an internal side chain high pass filter to control amount of low frequency pumping, smoothly adjustable compression ratio, ability to select which channel to process, and a link switch. This compressor also contains a dry signal blend for parallel compression. 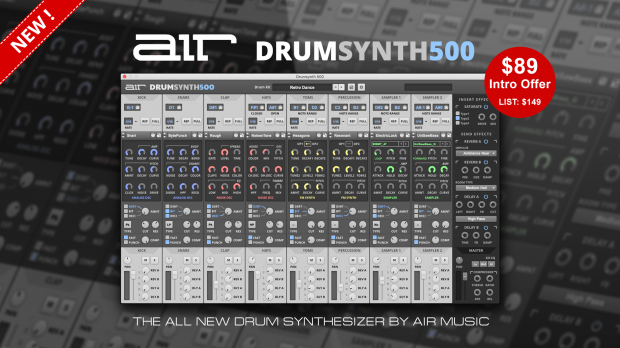 Drum Synth 500 from AIR Music Tech is everything you need to create an endless variety of custom electronic drum sounds in various styles. Available now at a special intro price of ONLY $89 ! Building upon AIR Music Technology’s heritage of creating Strike — considered “The reference Drum Instrument” for Avid Protools — AIR has teamed up with music legends Akai Professional and Alesis Drums to carry on this legacy of excellence. To get started, Drum Synth 500 offers over 500 drum sounds, 500 drum samples, 50 drum kits and 500 MIDI drum loops which can be loaded into any DAW and used to kick-start any song or production. 8 channel electronic drum synthesizer with fully programmable drum sounds in the style of 500 Series rack modules. Randomise feature for quickly generating new electronic drum sounds with just one button press. Audionamix has started their Spring Sale where you can get up to an huge 75% off on all their products until April 30th! See all the Audionamix Spring Sale Promos! This offer includes all their Bundles, the ADX Plug-in Bundle, the ADX Professional Suite, ADX Post-Production Bundle and the ADX Music Production Bundles as well as their well-known IDC, Trax, VVC, SVC and Trax Pro products. Audionamix is responsible for the development of ADX, the world’s first non-destructive, automated melodic audio source separation software. 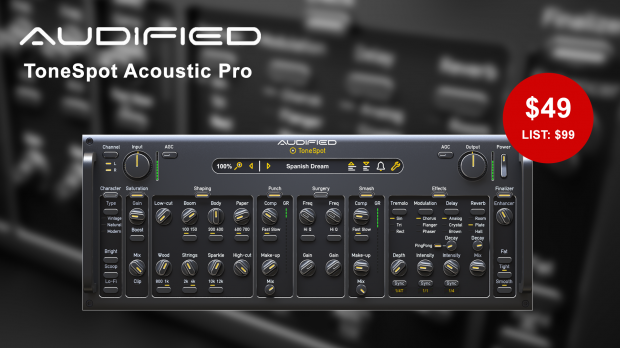 Recognised for its innovation, intuitive interface, straight-forward refinement tools and its ability to separate melodic content from mono or stereo audio files. If you’re an audio engineer, DJ, or producer, ADX technology will augment your creative options. Recording studios and post-production facilities can profit as well by exploring the many applications of ADX TRAX in music, film, and advertising. ToneSpot Acoustic Pro dramatically improves the tone of stringed acoustic instruments such as acoustic guitar, piano, violin, cello, banjo or mandolin.. Available now for 50% off! Get ToneSpot Acoustic Pro Here ! And that’s why you need ToneSpot. 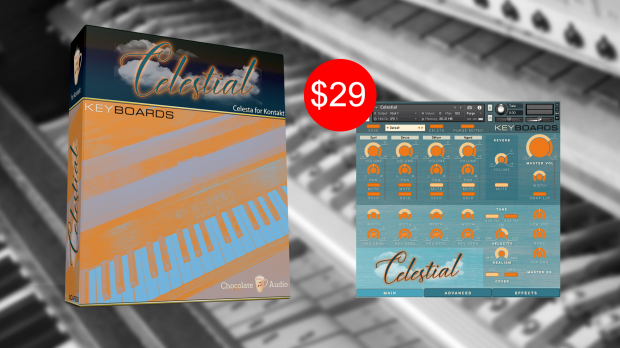 Chocolate Audio proudly release Celestial Celesta For Kontakt, a heavenly sounding Celesta for Native Instruments Kontakt. Available now for 40% off! Get Chocolate Audio release Celestial Celesta Here !